Einstein’s weak equivalence principle (WEP)is thefoundation of general relativity as well as of many other metric theories of gravity.In the parametrized post-Newtonian (PPN) formalism, each gravity theory incorporating theWEP is specified by a set of PPN parameters (e.g., the parameterγ which denotes the levelof space curvature by unit rest mass), which predicts that the parameterγshould be thesame for any two different species of massless (or negligible rest mass) neutral particles, orany two particles of the same species with different frequencies (i.e., , wherethe subscripts stand for two different particles). Hence, the WEP accuracy can bedescribed by constraints on the differences of theγvalues fordifferent particles through the Shapiro time delay effect(see Fig. 1). Figure 1.A cartoon picture shows how two GW signals, one at a high frequency ( ) and another at a low frequency ( ), travel in curved space-time from their origin in a distant extragalactic transient until reaching the Earth. 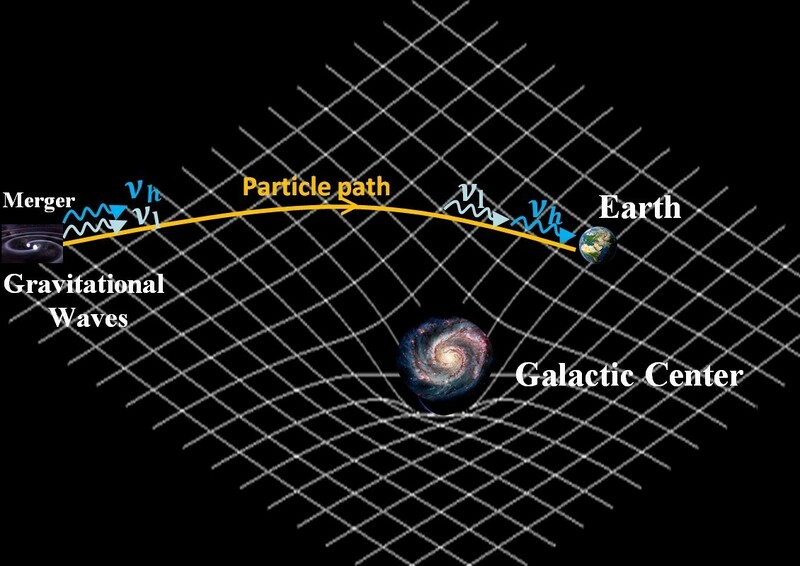 A lower-limit estimate of the gravitational pull that the GWs experience along their way is given by the mass in the center of the Milky Way. To date, only threeWEP tests with different species of messenger particles have been obtained, and moreover these tests were limited to the photon and neutrino sectors.New multimessenger signals exploiting different emission channels withhigh significance (e.g., GWs and photons/neurtinos) are essential for further testing theWEPto a higher accuracy level.Very recently, the LIGO-Virgo team reported the first detection of a new kind of gravitational-wave event (GW170817), which arises from a binary neutron star merger. Moreover, the EMcounterparts of GW170817, such as the short gamma-ray burst SGRB 170817A and a macronova within the nearbygalaxy NGC 4933, are firmly detected by the follow-up observations. This is thefirst time in history that gravitational and EM waves from a single astrophysical sourcehave been identified. Based on this first truly GW/EM association, we demonstrate thatnew, multimessenger WEP tests can be carried out by using the arrival time delays betweenthe GW signals from GW170817 and the photons from SGRB 170817A or the macronova.Attributing the time delays to the gravitational potential of the Milky Way, we set stringentlimits on the differences of the PPN parameter values for two cases, i.e., forthe GW170817/macronova, and for the GW170817/SGRB 170817A. If thetime delays are mainly caused by the gravitational potential of the Virgo Cluster, much more severe constraints can be achieved, implying for GW170817/macronova,and forGW170817/SGRB 170817A.The results from GW170817/SGRB 170817A provide the tightest limit to date on the WEP through the relative differential variations of theγparameterfor two different species of particles, namely , which is 7 orders of magnitudes tighter than that placed by theneutrinos and photons firmly detected from SN 1987A, and is as good as or is animprovement of 6 orders of magnitude over the limits obtained by the low-significance neutrinoscorrelated with GRBs and a blazar flare. The work by Jun-Jie Wei, Bin-Bin Zhang, Xue-Feng Wu,He Gao,Peter Mészáros, Bing Zhang, Zi-Gao Dai,Shuang-Nan Zhang, and Zong-Hong Zhuhas beenpublished in Journal of Cosmology and Astroparticle Physics.Please see JCAP, 11, 035 (2017) for more details(doi.org/10.1088/1475-7516/2017/11/035).